Levi's Stadium in Santa Clara, Calif.
As Super Bowl 50 descends on Santa Clara, Calif., the focus will be on the Carolina Panthers and Denver Broncos, but the stadium they're playing in will also be on display, boasting some of the most forward-thinking design practices in the NFL. Sustainability probably isn’t the most exciting subject in front offices around the NFL. But with big-money savings and positive effects on the fan experience, designing a sports sanctuary with longevity and environmental impact in mind is becoming the standard. With modern features like complex LED lighting, solar panels, concentrated-use energy systems and green roofs team executives can save their franchises millions. 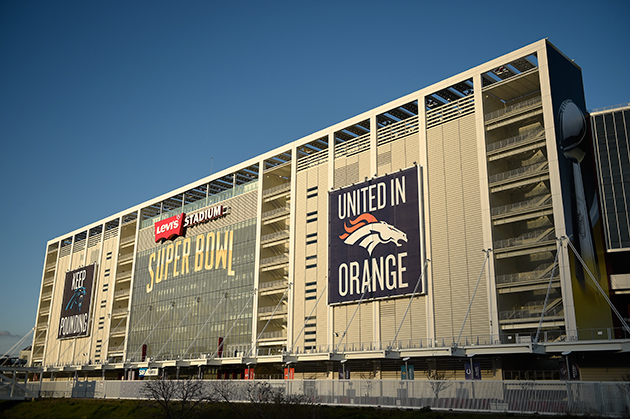 Fittingly, the NFL's marquee event, this year's Super Bowl between the Carolina Panthers and Denver Broncos, will be held in one of those monuments to forward-thinking innovation—Levi’s Stadium​, the home of the San Francisco 49ers in Santa Clara, Calif.
Jim Mercurio, 49ers vice president in charge of stadium operations, tells SI.com the sustainability mandate came straight from the York family and at no point were they interested in what he terms simply a "greenwash." “We actually believe in making a difference and if we can do it in this small park here, maybe we can inspire others, whether for stadiums or in everyday life,” Mercurio says. 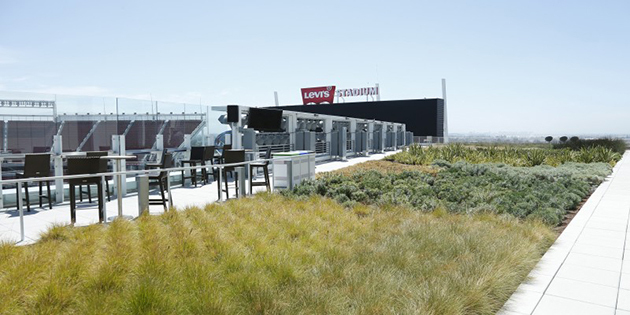 This sustainable effort has helped propel Levi’s Stadium, open now since the summer of 2014, into LEED Gold status (the second-highest level of recognition issued by Leadership in Energy and Environmental Design, an internationally recognized green building certification system). And as the 49ers prepare to host the Super Bowl—with the world watching—they want to use the platform to share details of their effort and the benefits for fan​s. 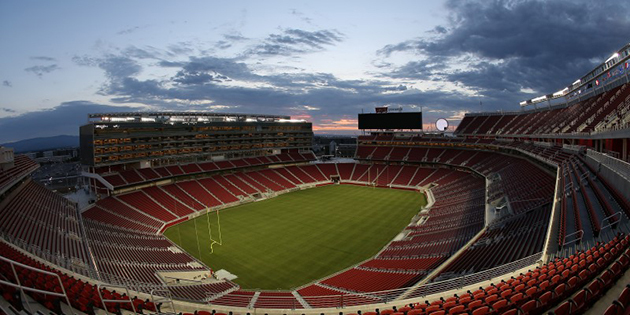 For LEED certification, the scorecards include decisions made when building—such as the 49ers’ embrace of local public transit, use of recycled materials from the old Moffett Field and sourcing of material locally—and then there’s the operational side of in-stadium recycling: water usage and energy reduction. The team uses systems designed to intentionally grab the water running off all areas of the building and use it in watering the landscape, the field and for bathroom facilities. And with artificial turf on the apron areas outside the playing surface of the field, those water needs have diminished in that area by nearly 30%. When addressing water, the 49ers also wanted to reduce usage during the cleaning of the building. Instead of spreading one-inch hoses around the building to saturate the facility in water, they invested in power-washing tools for more pressure and less water. “It is decisions like that that are viewed as efficient and smart and not wasteful,” Mercurio says. Then there are the small details that result in significant energy savings, such as clustering premium seating together, paperless ticketing, waste-flow efficiency and planting a garden atop the suite tower to reduce energy escaping from the building. The 49ers came up with a tailgating kit that offers bags to each tailgater, one for compost items, such as food waste, another for recycling and another for trash. Guido says the 49ers have talked to executives throughout the NFL trying to spread the word of sustainability. That group includes Arthur Blank, the owner of the Falcons, and Rich McKay, the Falcons president, as well as Mark Wilf, Vikings owner, and Kevin Warren, chief operating officer of the Vikings. “Sustainability is definitely gaining strength, gaining steam,” Cooper says. “We are seeing it across multiple sectors, sports as well, as an attractive point, a selling point.” Cooper's firm helped the 49ers in upping the benchmark in the NFL with creative concepts like reclaiming water for multiple uses, solar panel installations that collect enough energy to power the stadium for all 10 home games and a 27,000-square-foot green roof on top of the suite tower. The left-handed logic of New York Giants wideout Odell Beckham Jr. Designing differently takes effort, though. Jenkins, who also serves as the chair of the board for the Green Sports Alliance, says the easy thing to do is “mail in the design” and simply do what code dictates and not build sustainable. From locating transit nearby to reducing pollution to LED lighting—easily the best new return-on-investment trend in sports right now—renewable energy or waste-management systems, DeVolder says sports teams have become far more conscious about how they design, both for their own efficiency and as a way to educate the public. He sees the rise of sustainability as a trend in the past five or six years, but one that has become more readily available with increased partnerships and decreased costs. For the Falcons, DeVolder sees such features as shaded parking covered by solar panels, efficient energy systems, bike valets and electric car-charging stations as great examples. Of course, the waterless urinals will help in the building’s 44% reduction in water usage versus the Georgia Dome. A major effort in Atlanta will be the one-million-gallon storm vault to collect storm water and the 680,000-gallon cistern that can allow the Falcons to reuse the water on-site. The initiative also improves the local neighborhoods’ chronic flooding issues. Jenkins says that all those decisions had to come early, during design. For example, the retractable-roof stadium is being built like an outdoor stadium that can close when needed. “When outside, we want to rely on natural ventilation so we have to design it to function like an outdoor building,” he says. “But we have to be able to heat and cool when closed.” To solve that issue, the Falcons will have walls that can open and close to keep the natural ventilation intact and will use efficient boilers and chillers, a process that should bring energy demand to 34% below that of a normal building of the same size, saving $1 million per year in energy costs. “We have been really intentional and authentic in how we do sustainability initiatives,” Jenkins says. As part of the modern complex roof structure, WSP | Parsons Brinckerhoff will also be designing a 360-degree scoreboard for the Falcons stadium, in addition to smart technology that will provide new, creative ways for the team to interact with fans and educate them on the stadium's environmental features.